Inflatable paddle boards have been stealing the spotlight in the paddle boarding world for quite some time now. I’m not surprised by this considering that the modern versions are more rigid, durable, and track well than previous versions. At the same time, it can be difficult to choose the best inflatable paddle boards from all of the options available. This is why I decided to test out as many as I could to determine which one was worthy of investment. Below, you can find what I discovered when it comes to choosing top-notch paddle boards. I have also listed some of the paddle boards that I felt offered up the best performance. Whats Is The Best Inflatable SUP? The first thing to understand about inflatable paddle boards is the construction. To start with, most paddle boards are made out of tough, PVC material. However, in many instances, the real star of the show is the drop-stitch construction. With this process, two layers are sewn together with a large number of very thin threads. The purpose of this is to allow the external material – the PVC – to inflate and deflate at various pressure levels. This is one of the main features of inflatable paddle boards. Of course, not all inflatable paddle boards are constructed in the same way. They also differ in terms of the following technology: single layer, double layer, and fusion. Inflatable boards that are made from a single layer are often thicker to ensure similar rigidity as some of the other boards. While there are some versions that are comparable, they may not match up in terms of durability or stiffness. These boards are, however, less expensive and lighter. Then, there is the double layer construction – most of the boards these days boast this type of construction. These are quite durable and able to hold their shape incredibly well. The only downside is that they can be heavier and may be more difficult to carry around. Finally, there is the fusion construction. Now, it is important to realize that while this term may be used rather commonly, not all of the fusion technology boards are the same. The ones that truly use this technology are lightweight, stiffer, airtight, and more durable. Of course, the price tag on these boards often mirrors these capabilities. As you are aware, there are a few different types of paddle boards. Now, while there is some variation between inflatable paddle boards, there often isn’t a vast difference. Most inflatable designs are meant to be standard and so, can be used for a variety of activities. Still, the most common types are sport, yoga, and touring. Another variation between inflatable paddle boards is regarding the hull type. The hull is closely tied to the performance and the capabilities of the board. So, it is important to pick one that suits your ideal paddle boarding adventure. Now, there are two hull designs to choose from – the displacement hull and the planing hull. The displacement hull is slightly more pointed, directing water to the sides of the board. This is what makes these boards speedier, and perfect for touring or racing. However, you should be warned that they can also tip over more easily. As for the planning hull, it is smoother and more curved. These boards ride on top of the water rather than through it, making them an excellent option for waves. The boards also have the distinct advantage of being a great deal more stable as well. Nonetheless, these boards may not be too fast. You will discover that most inflatable paddle boards are between 9 and 12 feet long. For the most part, the widths will be determined by the length, for the sake of balance. However, they are between 30 and 36 inches in most instances. There are several elements that you will need to consider when figuring out what the best dimensions for you are. To start with, you will have to think about your own height and weight. Select a board that will support these measurements and makes it easy for you to keep your balance. If your main concern is performance and speed, then you should opt for a board that is longer and has a narrower width. On the other hand, if you would prefer stability, then choose a slightly shorter board that has a greater width. The thickness of the board is tied in with rigidity. Most paddle boards will be around six inches in thickness. This is especially true for paddle boards that have a single layer construction. This ensures that the board will be able to be rigid once fully inflated. If the material used in the construction of the board is thicker or of better quality, though. The board may be slightly thinner as it will not need to compensate for a less durable material. As you can imagine, inflatable paddle boards need to be inflated. Now, virtually all of these boards come with a hand pump that you can use to inflate them with. The actual effort that you will need to make will depend on the quality of the pump as well as the pressure required to keep the paddle board completely rigid. It should be noted that most paddle boards do require some work before they are all pumped up. However, if you don’t have a great deal of upper body strength, it is best to look for a paddle board that doesn’t require quite as much effort to inflate. The one thing that I can’t deny about this paddle board is that it is extremely well constructed. 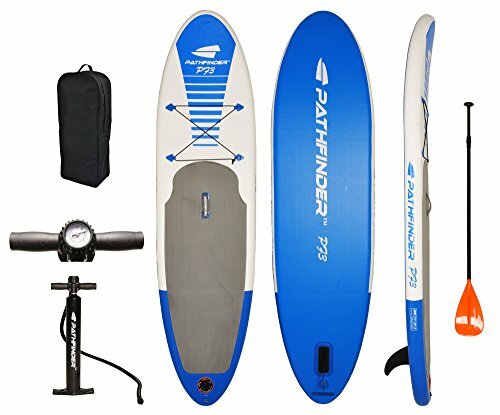 To begin with, the paddle board is made from military grade PVC material that works well for all types of environments. This, along with the high pressure finish and dual layer, reinforced core ensure that this is suitable for most of your water-based activities. This includes touring, fishing, and more. The only feature that I was disappointed in here was the valve. I found it difficult to get the pump hose to seal against the valve. I actually needed a friend to hold the hose against the valve while I pumped it up. However, once it is inflated, the board is suitable for riders of all experience levels. At 10 feet and a width of 32 inches, I found the board incredibly easy to balance on. So, it should work well for beginners too. Speaking of stability, I really liked the non-slip layer on the surface which makes it quite difficult for you to slip and fall, even when the surface is wet. Last but not least, the board is equipped with a number of accessories as well. These include the pump, paddle, leash, and backpack. 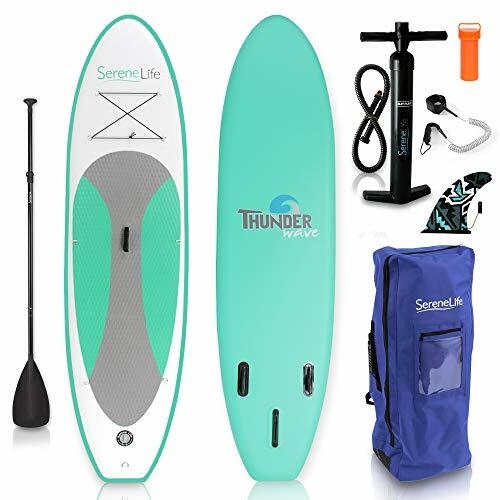 If you are looking for your first paddle board, then I would say that this SereneLife model is a good place to start. For one thing, the dimensions are perfect for someone who requires total balance. It is 10 feet long and 30 inches wide, ensuring that there is a great equilibrium between surface area and maneuverability. To add to this, the non-slip grip works really well and I found it a breeze to keep my footing, even out on the water. With a six-inch thickness, the paddle board inflates to perfect rigidity, ensuring that there are no dips or bumps along the way. My only concern is that it is incredibly heavy to carry in and out of the water, especially if you are on the smaller side. What more than makes up for this, though, is the overall construction of the board. The military grade PVC material, dual layer design, and reinforced drop-stitch technology ensure that this board can withstand all kinds of dings and bumps. With a max inflation pressure of around 15 psi, getting this board inflated isn’t too much of a struggle either. In addition to the typical pump and leash, this paddle comes along with a patch repair kit, bag, and paddle. If you are someone that is looking for a paddle board with a little bit of speed, then you will certainly not be disappointed by this board. At 11 feet in length and boasting a displacement hull, I found that this paddle board was quite speedy on flat water. The fin that accompanies the board ensures that the tracking is top notch and that you will have no problem staying on course. Unfortunately, fixing the fin onto the paddle board is incredibly tricky and that would be the main complaint regarding this board. While this paddle board’s focus may be on speed, it certainly hasn’t given up any balance either. At 32 inches, the width works to balance out the greater length. It also means that you have got more surface area as well. The board is six inches thick and when inflated is completely stiff and rigid. On average, this paddle board is capable of supporting weight up to 300lbs. So, if you want to bring along another rider, this is the perfect paddle board to choose. 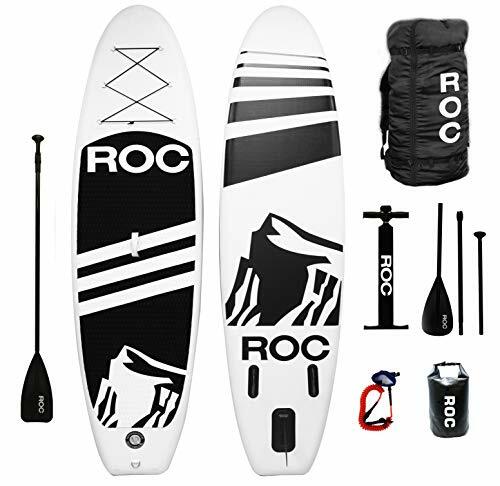 The paddle board comes along with a dual action hand pump, leash, bag, and paddle. As far as balance goes, I found this to be one of the more stable paddle boards of the lot. It is also a great option for younger riders or someone who is only just starting out. The board is less than ten feet long and is around 30 inches across. Due to this, I found it quite easy to keep my balance. It is these features that also make the paddle quite so maneuverable. While this board is only five inches in thickness, it is made from high quality PVC plastic. As such, the board remains just as rigid as those of a greater thickness. My top issue with this paddle board is the inflation process. While the pressure required is just 15 psi, it can feel like a lot more. Trying to get this paddle board can really take a lot out of you and it isn’t meant for the faint of heart. The only advantage with this is that this is quite a durable paddle board. The multi-layer, drop-stitch construction ensures that very few things will be able to put a dent in this paddle board. 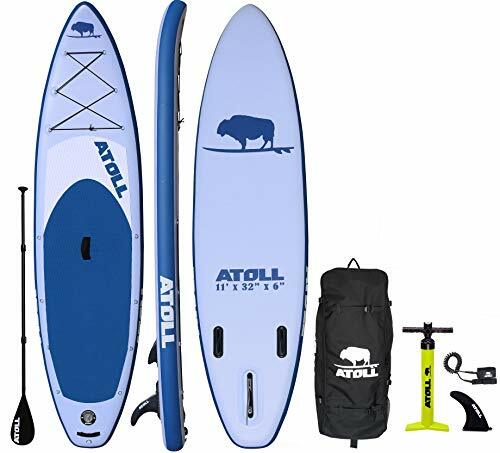 You get an adjustable paddle, pump, carry bag, detachable fin with the entire package. What I liked most about this paddle board was the overall maneuverability. This is certainly understandable considering the design supports such a feature. Not to mention, the large bottom fin worked to improve both the handling and the steering of the board. So, even if you don’t have a great deal of experience with paddle boards, you will still find it easy enough to get the hang of rising this particular one. The board also hits all the right notes as far as balance is concerned as well. A little over ten feet in length and 32 inches, this paddle board is built for stability. Your ability to keep your balance will be further aided by the fact that the board also has a diamond grooved deck pad that adds some serious traction to the surface. The board is six inches thick and boasts a high quality, military grade PVC construction that I am sure can withstand more than a few dings. The only aspect that I was disappointed with was the pump. It makes inflation incredibly difficult, exhausting, and time consuming. However, if you were to switch out, your troubles should disappear. What really stands out about this paddle board is the excellent construction. 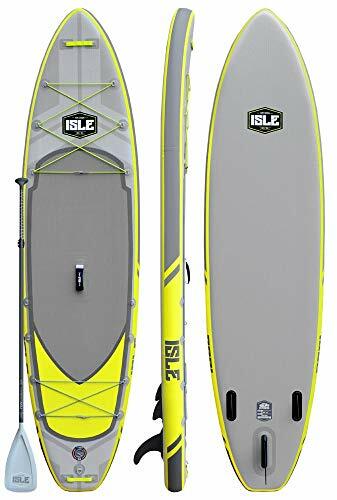 This one boasts Airtech Fusion-lite construction, ensuring that this paddle board is a lot lighter than many of the other markets on the brand. So, if you are looking for a paddle board that is easy to haul around, this would be it. Despite being lightweight, though, this board is far from fragile. The fusion technology also works to add some serious durability thanks to a special manufacturing process. As such, you can go paddle boarding in virtually any water environment that you choose. Now, this paddle board is a bit longer and narrower, which makes it excellent if you want to maintain a decent speed out on the water. However, I’m not entirely sure that it would be a good fit for a novice paddle boarder. While the overall stability is pretty good, it may take some skill to keep your balance while paddling. 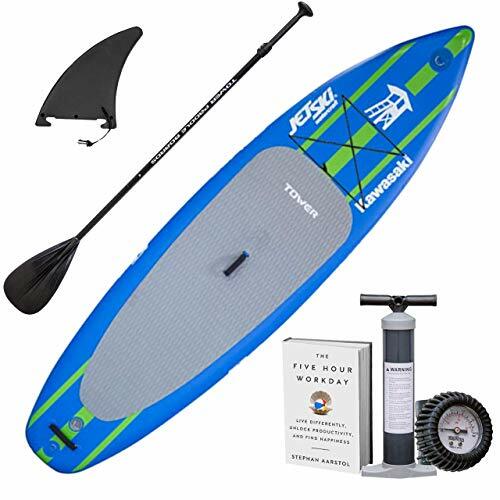 There are plenty of accessories that go along with this paddle board including an adjustable paddle, carry bag, and leash. What I certainly wasn’t impressed by, though, was the pump which made inflating the paddle board downright unbearable. If I had to select which inflatable paddle boards came out on top on this list, I would have to select two winners. If you are a beginner then the SereneLife would be the best choice. It provides riders with optimal balance, cutting down on the risks of accidents out on the water. For a more experienced rider, I would say that the Atoll would be a suitable option. The great maneuvering and emphasis on speed make it an excellent board for adventure. If you are looking for an inflatable paddle board, then this guide is sure to set you on the right path. The reviews and the buyer’s tip will make it a lot easier to figure out just which make and model to get.